Physical characteristics: The gray potoo's plumage is brown with streaks of other colors that include gray, black, and reddish brown. The bird has black streaks on the crown (top) of the head and the lower part of the body. The potoo's patterned plumage resembles the tree branches where potoos perch, so the birds can roost (rest) during the day without being seen by predators. Male and female potoos have similar coloring. The most colorful part of the gray potoo is the iris when the bird is seen at night. The iris is the round portion of the eye surrounding the pupil. If light is shined on the gray potoo, its irises look yellow or orange. The head-to-tail length of gray potoos ranges from 13 to 16 inches (33 to 41 centimeters). Gray potoos weigh from 5 to 7 ounces (145 to 202 grams). The gray potoo looks much like the northern po-too. However, their calls are so different that each was placed in a separate species. The gray potoo's call consists of five notes described by people as sounding mournful, or sad. The gray potoo is also known as the common potoo, the giant nightjar, and poor-me-one. Geographic range: Gray potoos live in Mexico and Central and South America. Birds are found in the countries of Costa Rica, Panama, Uruguay, Nicaragua, Colombia, Venezuela, French Guiana, Guyana, Ecuador, Peru, Brazil, Bolivia, Argentina, Tobago, Jamaica, Hispaniola, and Trinidad. Habitat: Gray potoos live in rainforests, coniferous or evergreen forests, and in grassland where there are few trees. Birds also live on plantations, land where people plant trees. Diet: Gray potoos eat moths, grasshoppers, beetles, termites, and fireflies. 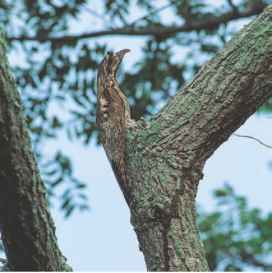 Behavior and reproduction: Gray potoos are solitary and monogamous birds. The breeding season when birds mate varies by location for this species found throughout much of Latin America. In Tobago, gray potoos mate between March and May. The female potoo lays one egg. 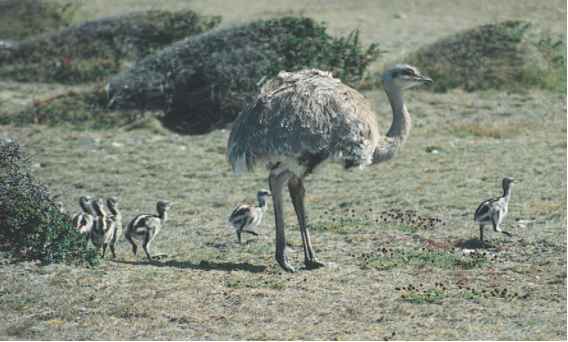 Both parents incubate the egg that hatches in thirty to thirty-three days. The chick fledges, grows its flying feathers, in forty to fifty-one days. Gray potoos and people: In Brazil, people thought the mournful song of the gray potoo was actually the sound of a person who had been unlucky in the love. According to the legend, either the love was unrequited (the other person wasn't interested), or the relationship was ended by death or separation. The potoo's sad call was thought to be the song of the unhappy person who had died and had been brought back to life in another form (reincarnated). Young, Bruce E., and James R. Zook. "Nesting of Four Poorly-Known Bird Species on the Caribbean Slope of Costa Rica." Wilson Bulletin (March 1999): 124. Tobago Home Folklore and History of Trinidad and Tobago. http://www. tobago.hm/folk/bm001bird-c-l.htm#g (accessed on May 25, 2004).